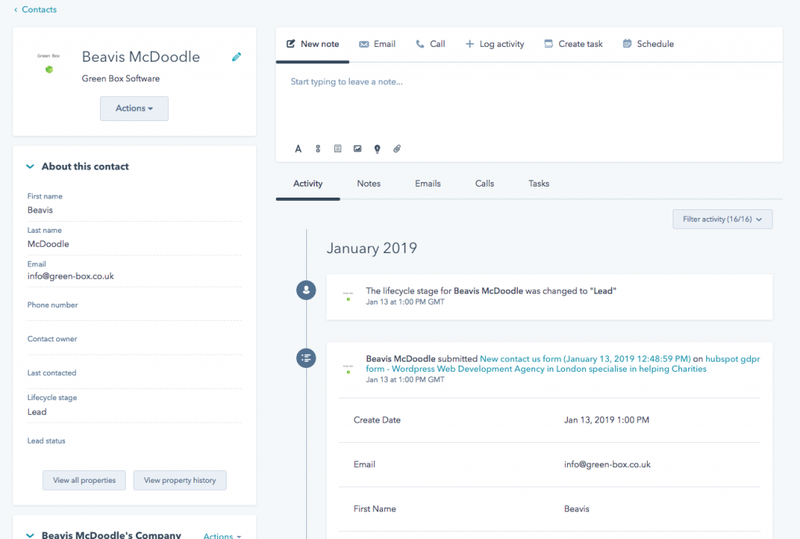 This post runs over why you would connect a CRM (Customer Relationship Management) system ( such as Hubspot) to your website. 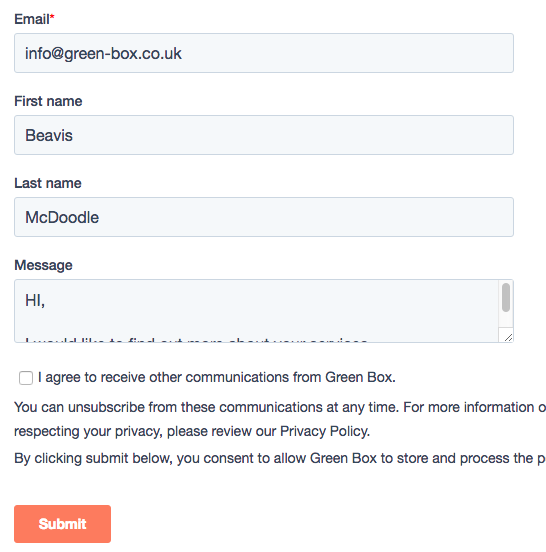 An example form might look something like above ( this is one I’ve generated in Hubspot , but you can customise and generate your own forms in many ways in Hubspot, manually with HTML or with a tool such as Gravity forms for WordPress, or with other tools). Also remember to make sure you are GDPR compliant if your in the EU. When the user submits the above form, this is what is will look like in Hubspot. As you can see the data from the form is recorded in the activity section above and a new contact (Beavis) has been generated in the CRM contacts database. Where you can record all your interactions with this contact ( email , phone and so on ). Emails can also be automatically logged into your CRM and you can automate replies to emails with Marketing Automation sequences. This can be very useful when you have a large number of users (for example your supporters contacting your Charity or Not for Profit Organisation). I’ve been using Hubspot in this article but the same can be done with others such as Salesforce ( and many others ). I haven’t gone into much technical detail in this post, only why and what are the benefits of this. CRMs are great for following up and interacting with your supporters, customers, leads and so on. I hope I’ve shown you how you can easily ( and automatically ) put form contacts from your website into your chosen CRM, to make this process easy and save you time. I plan to write another article on the technical aspects of how todo, what I’ve described briefly ( integrate your WordPress website with a CRM like Hubspot) in the coming months, but if you’d like help with doing this then please contact us below.